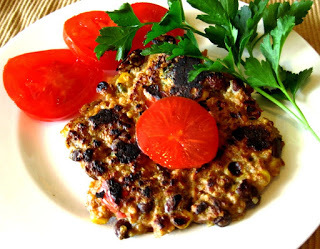 Veggie burgers with quinoa and black beans - great taste! Veggie burgers — talk about a main course meal in one … THIS IS IT!!! My recent discovery of quinoa unleashed my creative veggie juices in the kitchen. I love veggie burgers, but I find that most of them are filled with too much rice. So they taste somewhat bland to me. Therefore, I believe what veggie burgers need is lots of flavor, spice, and texture. They need to stand on their own with a side salad or go great on a thin bun. Because I wanted a better veggie burger, I created this recipe. I searched for and found the perfect combination of all my favorite vegetables and spices, then put them all together. The result is this power packed nutrient rich burger. The absolute BEST part is MY FREEZER IS STOCKED with a ready to go meal anytime. This is a roll up your sleeves and spend some time in the kitchen moment that will be worth the effort. Allow at least 3-4 hours from start to finish due to set time of the veggie burger in the freezer before cooking for a minimum of 1 hour. I placed most of the vegetables in my blender on chop mode to save time. A food processor would do the same thing, or if time permits, a good old fashioned chop with a knife. Once the veggies are prepped, and the squash pre-cooked, the recipe goes together much faster, but do be prepared to spend at least an hour in the kitchen. I did use a knife to chop my butternut squash into very tiny cubes, placed in gallon size storage bag with some olive oil and sea salt and baked for approximately 30 minutes on 350 degrees until soft. Set aside the squash for later. Oil or spray a large skillet or sauté pan to prevent sticking. On medium high heat, add onion and cook until soft and translucent, about 8 minutes, add garlic, cook for additional 30 seconds or until fragrant. Add cooked butternut squash, carrots and celery. Sprinkle with a teaspoon of salt and cook for about 10 minutes, stirring on occasion. Add the jalapeno, remaining 1 ½ teaspoons salt, cumin, black pepper and paprika. Cook for an additional minute. Add the corn and bell pepper and cook for two more minutes. Transfer the mixture into a large bowl, add the whole wheat flour and stir to combine. Add the quinoa, black beans and parsley. Using a large spoon, mix thoroughly and feel free to use your hands instead of the spoon … messy fun. The mix will be very mushy. Beat the eggs in a cup and pour over continuing to mix thoroughly. Line 2 large cookie sheets with parchment paper. Using your hands, form the mixture into 12 uniform burgers, again, the mixture will be mushy but do not be alarmed as the burgers will set up in the freezer. Place the cookie sheets in the freezer and check after one hour. If patties are firm and hold together when you try to peel away from the parchment, you are ready to go. Remove what you need for the meal and thaw just enough so that they are still firm enough to place on the griddle. Keep the remaining burgers in the freezer and chill to very firm and able to peel off the parchment and place in gallon size storage bags for a ready to eat meal anytime. Thaw the burgers before cooking. Oil a large griddle and place on medium high heat. Cook the patties until they are browned, about 5 minutes per side.